Soldering jobs of all levels range from the easy to the incredibly challenging. To achieve a quality result you need ability, know-how, and the proper tools. We're constantly on the lookout for great soldering tips, tricks, that perfect how-to article, and of course, the best tools that we can share with you. Using the correct soldering iron is like using the proper gas in your car: If you choose the wrong one your iron's performance will suffer and you may even cause damage to your project. QSource.com's line of soldering irons from industry leaders like Hakko, JBC Tools, Metcal, OKi & Weller includes tools perfect for a variety of soldering applications. We have general-purpose irons like JBC's T245-A Standard General-Purpose Soldering Handpiece. Or, if you are attempting more difficult soldering, such as high heat sink applications, check out this FM-2030 Heavy Duty Soldering Iron from Hakko. After you've selected the correct iron and solder, you should consider your workspace. 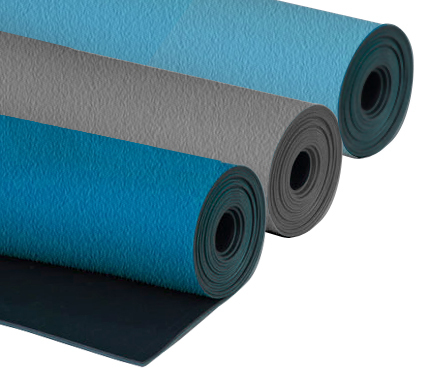 Using an ESD mat at your workstation or table helps protect your project from ESD damage. QSource.com offers a number of ESD Table Mats from Transforming Technologies & 3M that will do the trick. For example, this ESD-safe, rubber mat from Transforming Technologies' MT-Textured Series offers excellent resistance to soldering irons, hot solders, and most solvents. If you're doing precision soldering, or need to firmly secure the item you're working on, a handy option to consider using is a vise or work holder. Featuring heavy-duty items from Fancort Industries & PanaVise Products, QSource.com has a number of styles suited to just about every type of work-holding need. We've previously told you about the high-quality PanaVise 324 Electronic Work Center and recommend that you check out our article and video for further details. Another important factor to consider for your soldering environment is fume extraction. During soldering, certain rosin-based soldering fluxes and/or lead-based solders produce dangerous fumes when heated (especially at high temperatures). Exposure to these fumes can lead to respiratory problems, skin reactions, and even cancer. Using a fume extractor or smoke absorber can protect you from the risks posed by these hazardous fumes. At QSource.com, we offer dozens of fume extraction units and accessories. The Hakko FA-430 Fume Extraction System offers three airflow settings and a built-in filter replacement function. 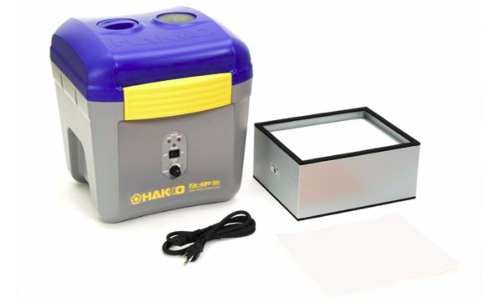 The more compact Hakko FA-400 ESD-safe Bench Top Smoke Absorber can be positioned in three different configurations with the horizontal position being the most efficient and providing the most airflow. One way to help keep your soldering tip clean is by using flux before you begin working. Made to remove oxides and keep them away while you solder, flux is a great resource to have on hand. The main decision when choosing a flux is how active it is. Highly active fluxes can remove more difficult oxides and do it faster. For hand-soldering projects, the usual choices include "no-clean" and RMA at the less active side of the scale and RA and water soluble at the higher end. You'll find a selection of quality flux products from AIM Solder and JBC Tools at QSource.com. AIM's No-Clean Liquid Flux is a good example of an alcohol-based flux made for lead-free soldering applications. If your soldering tips have become dirty, it's a good idea to clean them before starting your soldering job. We've compiled a complete department of soldering accessories (featuring great brands like Hakko, JBC Tools, Metcal, OKi, Plato, R&R Lotion, Techspray, and Weller) including items for tip cleaning. Quick and easy ways to clean your tip include JBC's Brass Cleaning Wool or, if you do a lot of soldering with lead-free alloys using high tip temperatures with very active fluxes, you may want to try Hakko's FT-700 Tip Polisher. Another great way to keep your soldering tip clean and extend its life is by using a tip tinner. By coating the tip with a tip tinning product from JBC Tools, Plato, or R&R Lotion, you'll protect, arguably, the most important part of the iron from harsh soldering environments. R&R Lotion's TIP-T I.C. Lead-Free Tip Tinner is great for use with no-clean, rosin, water-soluble, and lead-free fluxes. We'll leave it for a how-to article to cover the best process of how to apply solder. But we will offer up one suggestion for those of you using the JBC Tools NP105 Nano-Tweezers. For a more precise grip and better control of the iron, how about trying these replacement N1738 Sleeves? Check out this article, to learn more about how the N1738 Sleeves provide greater accuracy. Different soldering jobs require certain tip types and specific kinds of solder. At QSource.com, you'll find more than 500 quality soldering tips from brands like Hakko, JBC Tools, Metcal, OKi, and Weller. 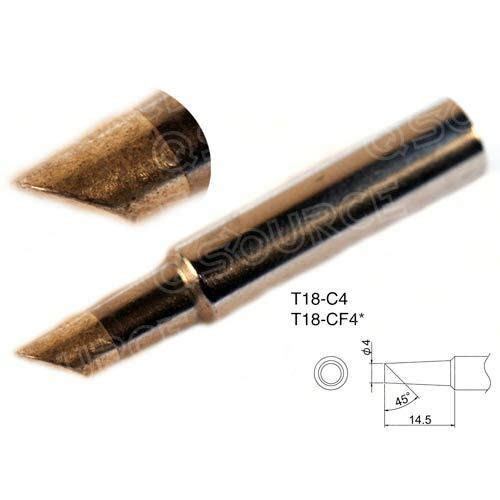 Need a conical tip from Hakko or perhaps a chisel tip from Weller? We've got them! And don't let us forget to tell you about our selection of soldering pastes, bar solders, and spool wire solders from AIM Solder. When you've finished your quality soldering job (and we know it's quality because you've read this article and chosen all the right tools), you may want to clean up the leftover flux and residue. Whether you decide to clean up the residue, especially with "no-clean" fluxes, depends on your workplace standards, cosmetic preferences, and the type of project. To help you attain your cleaning standards, QSource.com carries flux removers/cleaners from MicroCare & Techspray with a range of choices from MicroCare's complete Circuit Board Cleaning Station Kit to Techspray's EcoLine™ Flux Remover 10-ounce can. Well, there you have it: Our quick guide to using the proper tools to make your soldering jobs easier. QSource.com offers more than 1,600 soldering- and desoldering-related items to help make your soldering experience successful. We'll continue to tell you about new tools as we get them and pass along those great soldering tips and videos we discover from around the Internet. If you have a specific soldering-related need and you haven't found it on our Web site, reach out to us and we'll be happy to help you. Our knowledgeable experts can be contacted via phone (800-966-6020) or email. Happy soldering! * We understand your methods may vary. ** We're also assuming that you already have a soldering station.